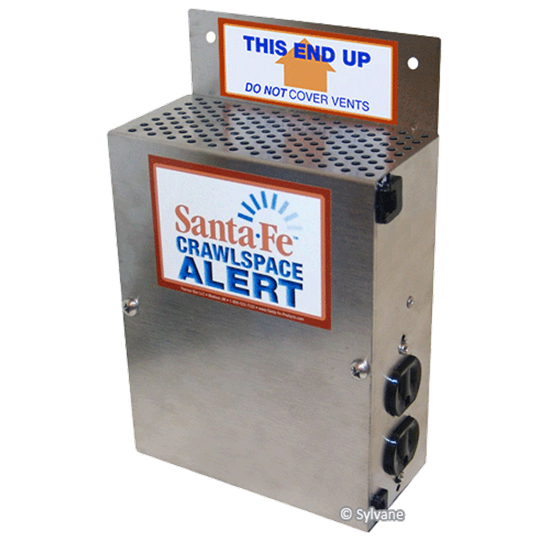 The Santa Fe Crawl Space Alert is installed to work in conjunction with a Santa Fe Dehumidifier to continuously monitor a variety of conditions in the crawl space. This advanced moisture monitoring system alerts you at the first sign of high humidity levels – giving them 24/7 peace of mind. If the Crawl Space Alert detects an issue, the orange warning lamp will light up signaling you to contact your crawl space professional. In the event that the condensate pump switch is tripped for any reason, the Crawl Space Alert will automatically turn the dehumidifier off in order to prevent water from overflowing into the crawl space.